HOW DO OUR PADDLEWHEEL FLOWMETERS WORK? Our paddlewheel flow meters consist of two major components; the pipe adapter and the paddlewheel sensor. 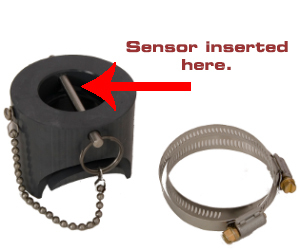 The paddlewheel sensor is designed to be inserted into any of the adapters. Liquid flowing in the pipe causes the paddlewheel to spin at a rate linearly proportional to the flow rate. Magnets, contained in the paddle, rotate past a switch; pulses from the switch are processed by the microprocessor and then displayed as a flow rate on the LCD display. The PT is used effectively as a pool water meter, and for septic effluent, and gray water applications. In addition, utilizing the remote mount display it makes the perfect solution for meters that are installed in a pit. Adapters allow the same meter head to be mounted to the various sizes and schedules of pipe. The same meter head can be programmed for the different pipes. Adapters come in two different varieties. * Pipe Mounted- The fitting for the meter is solvent welded to a 13" section of pipe. Pipes sizes range from 1/2" to 4". *Insertion Adapter - Saddle style fittings are designed to mount directly on your existing pipe. The saddle is installed by clamping the saddle onto and then drilling an 1 1/2" hole in the pipe. Cutting the pipe is not necessary. Saddles are available for Schedule 40 & 80 pipe, in addition we can machine adapters for specific applications. PADDLEWHEEL SENSORS(meter heads) – The Paddlewheel sensors are all the same. They are field programmable for the different pipes and schedules. The flow rate must be within the recommended range for the flowmeter to function properly. Inadequate flow velocity in large pipes is the number one reason flow meters don't operate as expected. An adequate flow not only reliably spins the paddle, it also washes silt and air bubbles out of the pipe. If the flow rate is at or below the minimum recommended rate, neck down to a smaller diameter pipe. If you are ordering an insertion style adapter for your existing plumbing, it must be for your exact pipe. The adapters are machined to fit the outer diameter of the pipe and also compensate for pipe wall thickness differences. Therefore, if you mount an adapter for a schedule 40 pipe on a schedule 80 pipe, the meter will produce very inaccurate results. We can custom machine adapters as long as the pipe has a smooth outer surface. 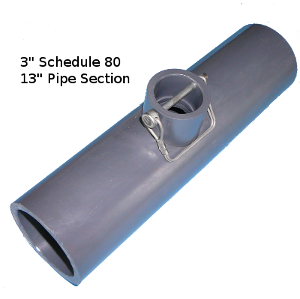 In the 1/2", 3/4" and 1" models the adapters are only offered in schedule 80 pipe sections. Schedule 40 fittings and pipe will glue directly to schedule 80 pipe, the pipes have the same outside diameter. For pipe sizes 2" and smaller, most people purchase the pipe section adapter as they are easier to install. However, with 3" and larger pipes, splicing in a section of pipe becomes more difficult and the insertion mounted adapters are desirable. The six and eight inches meters are only offered in the insertion mounted style. WE RECOMMEND ADDING THE REPLACEMENT PLUG. This will allow you to securely plug the opening if you ever need to service or remove the meter. IMPORTANT: The Pulse Output option does not come with a display, only the pulse output wire. The accuracy is based on steady, undisturbed flow with a fully developed turbulent flow. Swirling and other disruptions in the flow will affect the meter’s accuracy. Uniform developed flow is produced in straight runs of pipe. The meter must be installed in a straight length of pipe with at least 10 pipe diameters upstream of the meter. The length of pipe downstream must be at least 5 pipe diameters. Major flow obstructions, such as gate valves, pumps and multiple elbows will require longer straight runs of pipe before the meter. Back pressure is needed on downward flows to assure the pipe remains full of water. IT MUST BE A COMPLETELY FULL PIPE OF WATER WHEN MEASURING TO BE ACCURATE. "Schedule" refers to the thickness of the pipe wall and, therefore, how much pressure it will hold. In most aquaculture applications, Schedule 40 is used. SCHEDULE 40: From 1/2" to 2", it is rated at no less than 140 psi at 73°F. SCHEDULE 80: Up to 2", it is rated at no less than 200 psi at 73°F . * For Wall Mount Display please indicate the number of feet you want the wire to be between the sensor and the display. 15' is the maximum, however the battery will last longer if you only have the distance you need (the shorter the wire, the longer the battery life). If this information is not filled out for the Wall Mount Display we will email or call you. Your order cannot be shipped without this information.